My sister Sheila Polk gave a presentation to students at CONALEP Plantel Temixco, a technical high school near Cuernavaca, and I jumped at the chance to go along. Retired or not I still love going to schools and this one was awesome. They have a strong career prep program and it was a delight to talk with students about their studies and plans as we walked through the campus. I was able to make a very sketchy sketch which captured the basics but did not do justice to the youth and attentiveness of the students or the composure of my sister speaking in Spanish to the 150 students in the auditorium. I took quite a few photos and plan to use them as reference for a second try at this subject. I hope to better convey my sister’s animated style and the intense and respectful expressions of the students. This entry was posted in Body Language, Facial Expression, Groups Interacting, Learning, People Learning and tagged CONALEP Plantel Temixco, Emoting, Gouache, Line, Mexico, Nonverbal Communication. Bookmark the permalink. 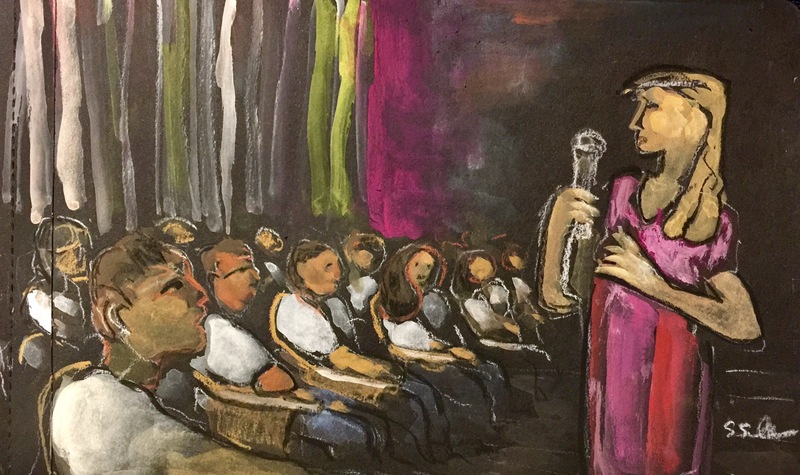 Love the strength and delineation between students and speaker in this sketch. The students were so kind to me and I love how this drawing captures their genuine respect and engagement.